Please join us for an event featuring Obama’s speech streaming from Ghana along with leaders speaking: Kenton Keith, Tim Burke and Derrick Ashong. On Saturday, July 11, a global conversation will push definitions of citizenship by demonstrating how new technologies enable global civic participation. Citizens from numerous countries will meet together in virtual worlds to collectively watch a speech from President Obama, view Twitter feedback on his talk, and a join in discussion with musician and activist D.N.A. (Derrick Ashong), Ambassador Kenton Keith and African historian Professor Tim Burke. 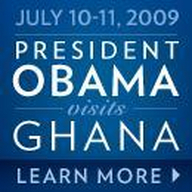 President Obama will speak to a live audience in Ghana, Africa. His speech will recognize Ghana’s stable democracy and leadership in the region. It is expected that Africans from all over the continent will converge for this momentous speech. The White House is using a Twitter feed which will enable individuals from around the world to participate in the conversation and share their thoughts with President Obama. This event provides a public sphere for people to come together as citizens sharing independent views which in turn shape the political institutions of society. These conversations, literally hosted in a virtual physical space, are essential for the marketplace of ideas in our globalizing society. Following the event will be music from D.N.A. Please join us for this historic event.